Ms. Kahn served as a teacher of photography with celebrated artist Jim Dow at Tufts University. She pinpoints a major highlight of her career as her being selected as a teaching fellow alongside Pulitzer Prize winner Robert Coles at the legendary Literature Department at Harvard University. Under Coles’ mentorship, she led several undergraduate sections on documentary work at Harvard. Ms. Kahn’s studio is located in the Brickbottom Artists Building in Somerville, Massachusetts. Ms. Kahn is to be included in the upcoming third edition of ProFiles magazine, and later this year, she will be a featured guest on the Elite Radio Network. Ever passionate about her work, Ms. Kahn makes every effort to create remarkable documentary work, excel in the abstract and fine arts, and to strive for excellence in her every endeavor. 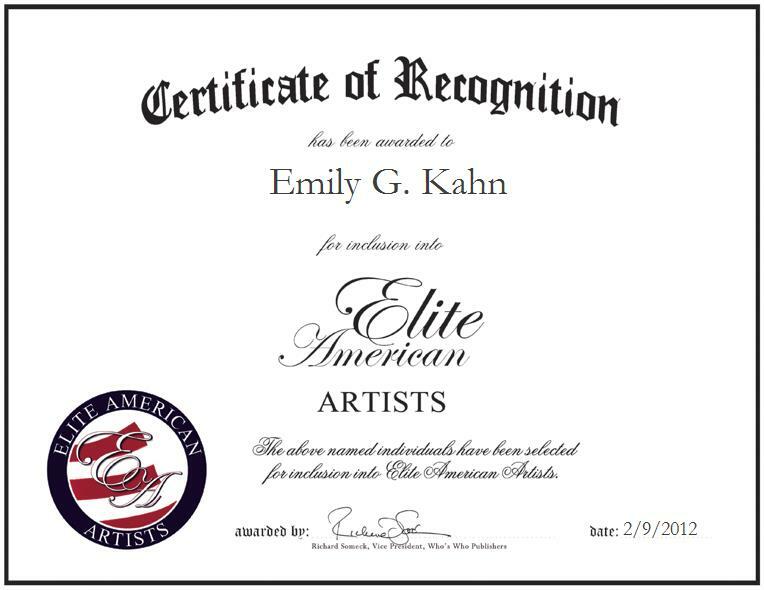 If you are interested in learning more about Emily Kahn, please visit her website http://www.emilykahn.com or email her at nhakep@aol.com.